The project overview summarizes the main information on the project. Change the project title and description, tags, as well as the project color (by clicking on the water drop icon). The project overview summarizes all project details. If a journey map contains comments from the comment mode, a small icon will indicate the number of comments on the journey map block. A journey map with two comments, indicated below the project title. Finally, you can manage the different users of the project directly on the project dashboard. 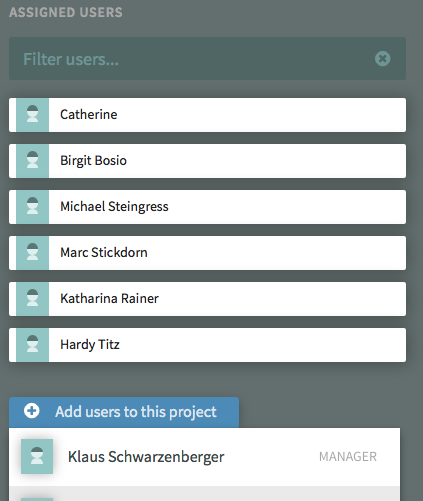 Add new users, delete current users, filter, and view the users’s role (member, manager) by hovering over their names. Hover over users in order to show the delete-icon or their account roles.